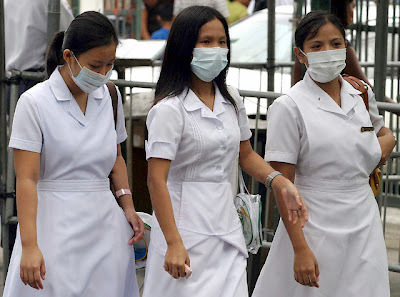 Taking up the cudgels for thousands of health practitioners, Senator Loren Legarda on Friday questioned the "highly restrictive" quota-based deployment of Filipino nurses and caregivers to "the land of the rising sun" under the Japan-Philippines Economic Partnership Agreement (JPEPA). "We definitely would have preferred the market demand-driven deployment of Filipino nurses and caregivers, instead of a prohibitive quota system," said Legarda, chair of the Senate committee on economic affairs. "There is a huge pent-up demand for foreign healthcare workers in Japan due to its rapidly aging population. The (Philippine) government is duty-bound to secure for Filipino professionals the greatest opportunity to cover this demand," Legarda stressed. According to a study by Nomura Capital Management Inc., Japan’s population is aging faster than that of any other country. The study said Japan would soon have only two able-bodied workers for every retiree. Attorney General Anne Milgram and Criminal Justice Director Gregory A. Paw announced that a Filipino woman residing in West Windsor , N.J. pleaded guilty Thursday to forcing a young Filipino woman who came to the U.S. as a nanny to instead care for her ailing husband and do her housekeeping for two years. The young woman's passport and visa were taken away, and she was told not to leave the house without family members because she would be arrested. She was paid only a small fraction of what she was supposed to receive for coming to work in the U.S.
President Gloria Macapagal Arroyo’s endorsement for mandatory Social Security System coverage of overseas Filipino workers is just "another extortion scheme" aimed at OFWs, a Hong Kong-based Filipino group said Thursday. “The unbelievable greed of the Arroyo administration for the money of OFWs is again shown by its effort to corner our earnings through the SSS coverage," said Dolores Balladares, chairperson of the United Filipinos in Hong Kong (Unifil-Migrante-HK) in a press statement. The newly-imposed deployment guidelines exact from OFWs additional fees for retraining and other requirements. There is the membership fee for the Overseas Workers Welfare Administration. Add to these the rising value of the peso that continues to erode dollar remittances, Balladares cited. According to the group, the expanded SSS coverage proposal is another item on the list of moneymaking schemes of the administration. Foreign women who are victims of trafficking can now get support at the Maagan shelter in Tel Aviv. In 2002 the Israeli government, in an attempt to encourage these women to testify against the people who bought and sold them, decided to offer them work visas in return for sworn statements detailing their tribulations. The visas run until one year after the end of their trials. About 250 of these women have been through the Maagan shelter in the last few years. According to estimates, several thousand victims have been trafficked into and within Israel since the 1990s. Those who cooperate become eligible for rehabilitation through the shelter, which is funded by the Israeli Ministry of Welfare. Thursday, September 6th- Federal agents today arrested two men and a woman from Togo who they say smuggled at least 20 girls and young women from the West African nation and forced them into indentured servitude, working without pay at hair braiding salons in Newark and East Orange. "This is a case of modern-day slavery," said Tom Manifase, deputy special agent in charge of investigations for U.S. Immigration and Customs Enforcement (ICE) in Newark, the lead agency in the investigation. "These women were promised a better life in the U.S. but instead ended up becoming victims of human trafficking." Immigration Commissioner Marcelino Libanan has ordered his officers and agents in different airports and sub-ports to intensify the campaign against human trafficking. "This is a very serious problem and we in the Immigration bureau, being the country's chief gatekeeper, should do our part in stopping this human trafficking menace from victimizing more of our countrymen," Libanan said after the United Nations reported that one in four of humans trafficked across the globe were Filipinos. Libanan admitted that he was so alarmed by the report that he immediately issued a directive to his men at the Ninoy Aquino International Airport.